It is one of the most gruelling sporting events on the planet. Over three weeks ago, 198 cyclists departed from Passage du Gois. On Sunday afternoon, the remaining 167 cyclists crossed the finish line on the Champs Elysee to mark the end of over 3,400km of racing. 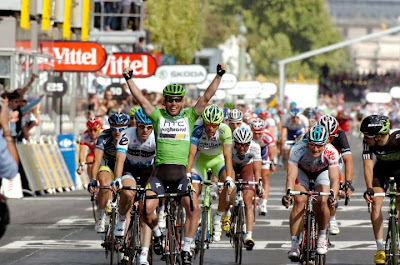 As he has done for the past two years, Mark Cavendish was able to stay ahead of his rivals in the sprint finish and claim his third successive Champs Elysee victory and continue to cement his name as one of the greatest sprinters that the sport has ever seen. However, he still seems to struggle to gain the recognition in the UK that he deserves. This is due to two reasons. Firstly, the lack of attention that the Tour de France, and particularly road cycling in general, receives in the UK media. Mark Cavendish’s fifth stage win of this year’s Tour de France received a small story on the BBC Sport website, yet no coverage whatsoever on the BBC news programme. It was a small story tucked away in the depths of the sports pages in most national newspapers. 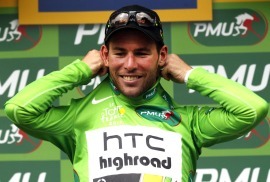 On the continent, Mark Cavendish is like the David Beckham of cycling. In countries like France, Belgium and Spain where cycling is a serious sport, he is one of the most famous sporting names. However, back in the UK, it would be fair to assume that only a small proportion of people have heard of Mark Cavendish, and even if they have, would not realise what a major star the man is. The second reason is linked into the first reason. There is a general lack of understanding of how exactly the Tour de France works. There is the common misconception that Mark Cavendish won five out of the 21 stages, so he should be winning the Tour de France. However, the Tour does not work exactly like this. There are four different jerseys that are up for grabs in the race. The yellow jersey (Maillot Jeune) is awarded to the rider with the best overall time. Generally, there are only a small handful of riders who could even challenge for this jersey. To win it, you must be one of the few riders that truly excels in the high mountains, as well as being able to stick with the pack on the flat stages and being able to time-trial with the best of them. If you lack in one of these attributes, it will be difficult to win the yellow jersey. Andy Schleck is arguably of the best cyclists of his generation in the mountains, but his lack of time-trialling ability meant that even though he carried a lead of almost a minute into the final time-trial, he ended up finishing the overall race in second place by over 1’30. This very small flaw in his riding ability will always make it tough for him to win the yellow jersey. The second jersey is the green jersey, designed to determine the best sprinter. This is the jersey that Mark Cavendish won. Points are awarded for finishing position in each individual stage, as well as intermediate sprints at various points through the stage. The overall time that each cyclist finishes in the final classification is irrelevant when it comes to the green jersey. Mark Cavendish won five stages and consistently finished in high positions on the intermediate sprints. Through this, he accumulated 334 points. His closest rival, Jose Joaquin Rojas, accumulated a total of 272 points over the 21 stages. The fact that Mark Cavendish finished the overall race in 130th place, over three hours and fifteen minutes behind Cadel Evans, and almost 55 minutes behind Jose Joaquin Rojas, does not matter as far as he is concerned. The third jersey is the polka dot jersey, which is awarded for the best climber in the race. At the top of each climb, there are a certain number of mountain points available. The bigger the climb, the more points are available. The natural climbers will often target this jersey. Even if they will struggle in other types of stages, they are able to race up the mountains faster than their rivals. Often the biggest names will appear high in this classification, purely due to the fact that they are some of the best climbers. This year, the polka dot jersey was won by Samuel Sanchez, who also finished sixth in the overall classification. Andy Schleck, Cadel Evans and Alberto Contador also featured in the top five, with Jelle Vanendert being the only non-GC contender to appear. Vanendert finished in 20th place overall, but was able to win one mountain stage and regularly appeared toward the front of the race over many of the mountains. The final jersey is the white jersey, awarded to the best young rider in the race. Any rider under 25-years old is eligible to compete for this jersey. It is awarded in an identical manner to the yellow jersey, but is focussed on the younger riders in the race. This year, it was won by Pierre Rolland, who finished 11th in the overall classification. Going into the race, no rider will be targeting all of the jersey. In this modern day, it is virtually impossible for any rider to be the best climber and the best sprinter. So when people question why Mark Cavendish is winning so many stages, but seems to be at the back over the mountains and finishing low down in the overall classification, it is because he is a specialised sprinter, not a climber. Compare it for example to athletics. Mark Cavendish is like an 800m runner. It requires some endurance, but the major part is a sprint finish at the end. Over the final 200m of a race, Mark Cavendish is the fastest man on the planet. However, he has also often ridden over 200km to get there. The likes of Cadel Evans, Alberto Contador and Andy Schleck are more like marathon runners. They will almost never beat Cavendish and the other sprinters in a short sprint, but over a 21 stage race, they will almost always finish above the sprinters. On a slightly unrelated point, but to continue the analogy, track sprinters, such as Chris Hoy, would be 100m sprinters. Their events are purely based on sheer speed over a short distance. In a track event, Chris Hoy will almost always beat Mark Cavendish. However, ask Chris Hoy to ride for 200km over hills before a sprint finish, Mark Cavendish will win almost every single time. 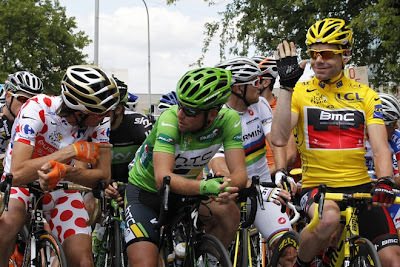 It is why Mark Cavendish will never win the yellow jersey for the best overall time in the Tour de France. However, criticising him for this misses the point. 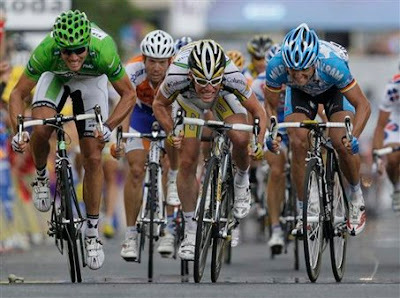 He is not racing to win the yellow jersey. He is racing for the green jersey. The Tour de France is like several races in one and each rider in the race has different objectives depending on his and his team’s individual strengths. After the final stage, David Millar said that he feels that Mark Cavendish is the greatest sprinter in the history of cycling. It is undisputed that he is the greatest sprinter of his generation. He has now moved onto 20 Tour de France stage wins in only four tours. To put this into context, Thor Hushovd, one of his main rivals, has 10 stage wins in eleven tours. Erik Zabel, who is considered one of the greatest sprinters of all time has 12 stage wins in six tours. Next year, he will likely overtake Lance Armstrong’s 22 stage wins and may even move into joint third on the all-time winners list with Andre Leducq on 25. Ahead of Leducq lies Bernard Hinault on 28 and then the legendary Eddy Merckx on 34. Given that Cavendish potentially has at least five or six tours left in him, it would be no surprise to see him eventually top this list. At the end of the day, it is the lack of attention that the sport gets combined with the misunderstanding of how the sport works that means that Mark Cavendish does not get the credit amongst the general public that he deserves. The Sports Personality of the Year award is often a decent indication of the recognition that athletes, particularly in the less mainstream sports, receive from the general public. Despite being a stand-out contender for this award, it would be a major shock if he were to win it. Elsewhere on the continent, he would be a big favourite to clinch the award. It shows the different attitudes toward the sport. Someone essentially help to make significantly posts I'd state. This is the first time I frequented your website page and to this point? I surprised with the analysis you made to make this actual post extraordinary. Wonderful activity!